Display Color Diffuse color for the Entities belonging to this Entity Type. When particles will be emitted from a Population Tool Locator, the rgbPP PPAttribute of the particles will be set to this color (for more explanation about how to use PPAttributes, see PPAttributes Handling). By default, the color considered to shared the Entities will be the one stored in the rgbPP PPAttribute. It is also possible to use the color defined in this attribute by unchecking the "Use Rgb PP" checkbox in the Crowd Manager Display Attributes. Weight of the Entity Color in the final shading. Two Sided Doesn't perform triangle culling based on its winding. Every triangles are visible from both sides. From FBX: shaders will be loaded from the meshes saved in the FBX file listed in the Geometry part of the Character file This is only valid if using a FBX file, GCG does not store shaders information. From Maya Scene: shaders will be loaded from the current Maya Scene (according to the shading assignment defined in the Geometry part of the Character file). 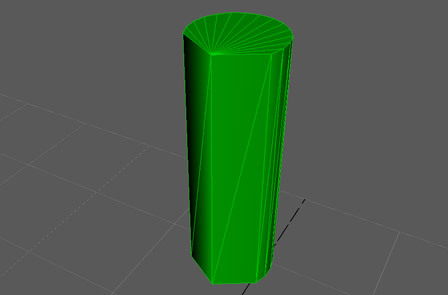 Name of the Maya Namespace to add to the to the shading assignment defined in the Geometry part of the Character file. This attribute only works if the Shading Mode is set to From Maya Scene. 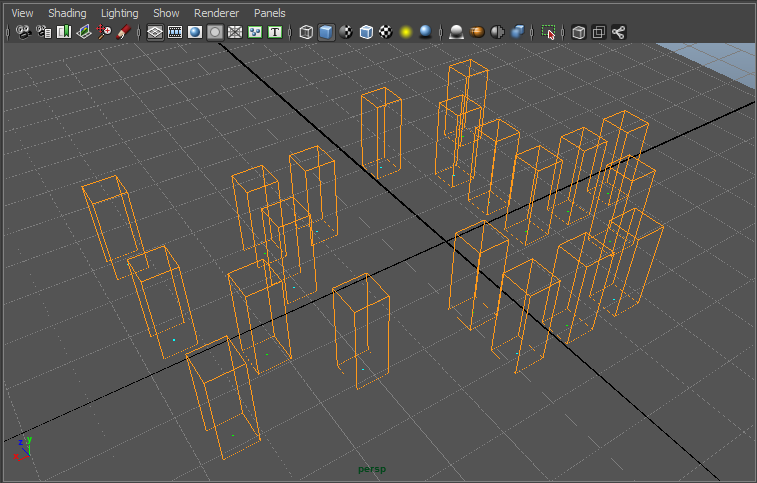 Flush the geometry cache and reload them (fbx and gcg files). Cylinder is the simplest preview mode. It is a modified cylinder, which thinner part indicates entity's direction. Radius and height of the cylinder are entity's properties defined in the Entity Type Attributes (see above). They both are scaled by the Entity scale. The Animation Bones mode displays a box for every bone composing the skeleton. The length of the box is the distance from the bone to its children median position. Its width and depth are a fixed ratio (0.25) multiplied by the Bone Radius attribute. The Physics Shape mode displays the physics volumes of the skeleton. Those properties can be edited in the Character Maker. Render Previz is available if you assign a Rendering Type to the current Entity Type. 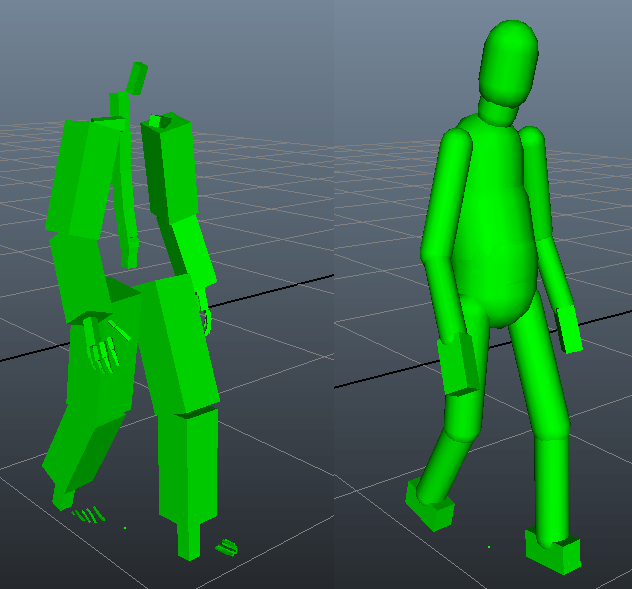 Once you set up the Character with the assets repartition and a corresponding geometry file (fbx or gcg), the Entities will be properly rendered. You will see the same mesh asset repartition as in your Simulation Render. The Render Previz will search and use the shader assets (diffuse texture or diffuse color) applied to the mesh. An orange Diffuse color will be binded if the shader is not present in Maya. For more comfort, the diffuse textures are loaded in the background. You may see them pop when running the simulation for the first time. The shader output plug color name used can be changed manually see "Color Attributes Names" below. If the geometry file is modified, you can refresh the Render Previz using the Refresh button in the attributes or using the Refresh button in the Character Maker. The Render Previz mode is performed by an OpenGL shader (.glsl). 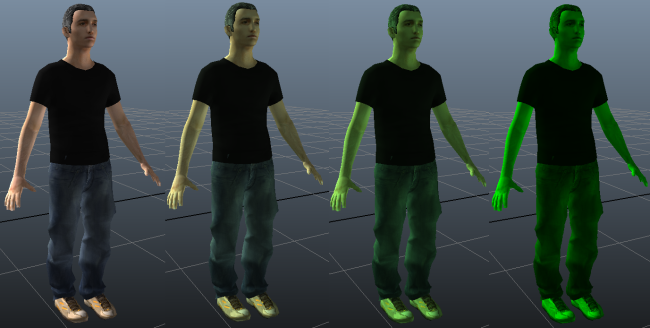 This shader can be found in the Golaem shaders directory, edited and overriden from the Crowd Manager. shading/texture variation (mainly for performance issues). This means that in Render Previz mode, all assets of the same type will have the same texture and you'll have to render the scene to get a visualization of the shading variation. per-face shading assignment. 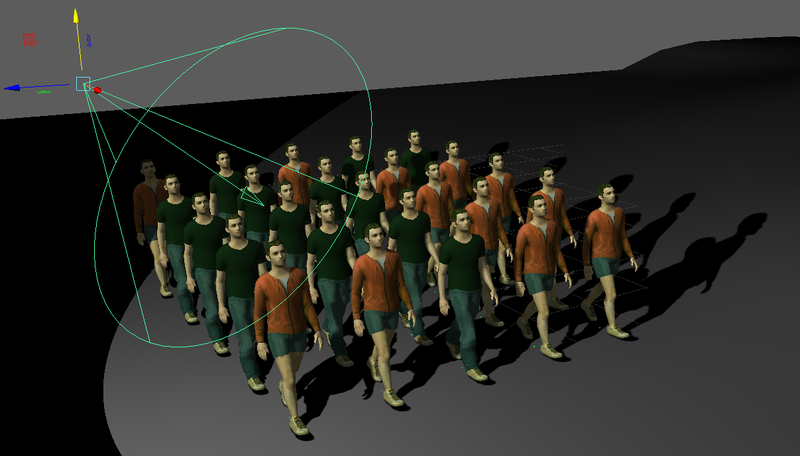 If a Mesh has several Shader Groups assigned, only the first one will be assigned to the whole mesh in the previz and you'll have to render the scene to get a visualization of the per-face assignment. Previz supports up to 16 lights which can be either spot, omni, ambient, point or directional Maya lights. 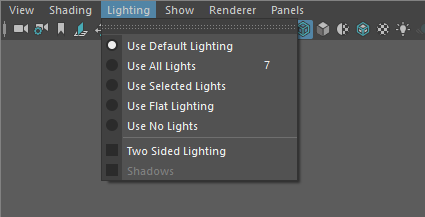 Use the Lighting menu in the viewport panel to activate it. 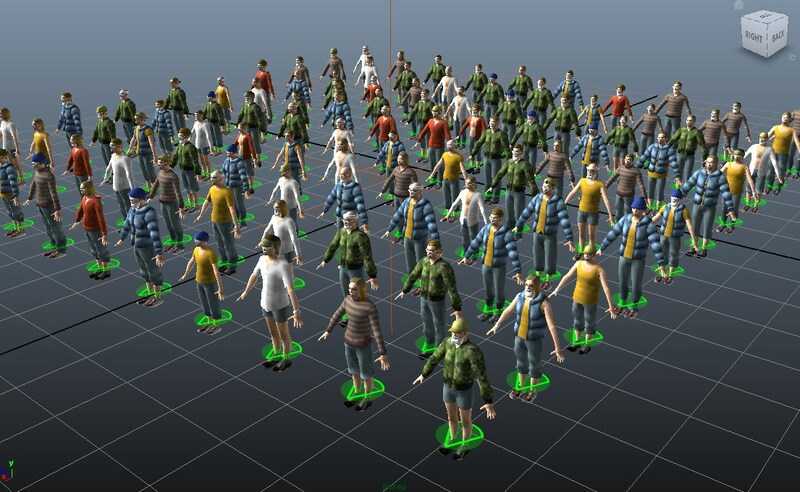 Golaem Crowd is compatible with Viewport 2.0 using OpenGL rendering. On some hardware, Maya only allows Viewport 2.0 using DX11 whether you chose OpenGL display. If the Viewport 2.0 display is DX11 entities will only be displayed with orange bounding box and an error message will appear in the console. Golaem with DX11 display compatibility mode.